Posted 3/29/2008 2:11pm by Laura Krutul / William Quick. Hail and good health to all gentles who read these words! We at Baronage Farm hope this Springtime finds you all well and prosperous, having survived the Winter's ravages. To all good people who stopped by to speak to us in Smyrna last month, we especially send happy tidings. We were very pleased with the amount of folks who stopped and showed an interest in our display, and who took the time to engage us in conversation. We joyfully announce the start of our new web site! 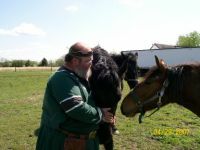 Please take a moment to check it at www.BaronageFarm.com and see what we're all about. The site is under construction, but we are updating the calendar as things are being scheduled here at the Farm. Please be sure to check it out. Our first Event of the season will be a Living History Weekend on April 5th and 6th. We welcome all Medieval Minded people to come out and spend some time with us. We encourage visitors to dress in Medieval Garb and come celebrate the season with us. All activities are outdoors, so plan for the weather. This is a weekend event starting on Saturday afternoon at 1pm and continuing to Sunday evening at 5pm. Martial activities will include Archery on Saturday and Sunday - loaner equipment is available. Baron William will be teaching sword fighting techniques on Sunday. Other martial fighting activities will be scheduled for Sunday if participants are available. Our Feast & Fire will be Saturday night beginning at 7pm. All are welcomed to camp on Saturday night - you must supply your own tent and camping equipment. We look forward to seeing you soon at Baronage Farm!